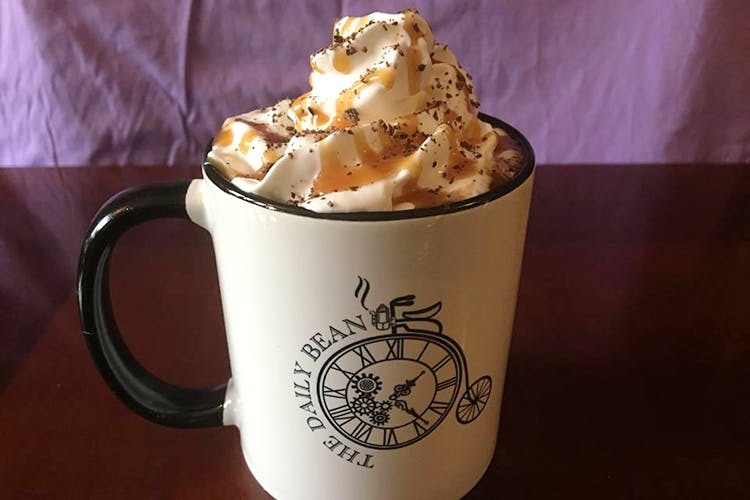 For free wifi, a vintage-esque decor and over 5 different kinds of coffee, head to The Daily Bean in Hennur. Your wallet is going to love this place! This cosy cafe just off Hennur Main Road is a perfect spot for your next date. The vintage-esque industrial decor with a steampunk edge consisting of light bulbs, a gramophone, cycle wall hangings, and other items of decor will immediately impress you. You could sit there for hours sipping on coffee and paying attention to the details of the cafe, which is all set up from scratch by the store owners. It is also an added benefit of free WiFi, so go ahead and work there. The place is owned and run by three people who grew up as ‘siblings’ in a model children’s home in Bangalore. And that itself makes us melt. It makes for a perfect place for an after college snack, somewhere to go alone and get some work done, or a first date with a romantic aesthetic. Especially since they have plenty offers including student discounts, and monthly specials. The cafe fits about 18-20 people, so you might want to go in small groups. From the rather elaborate menu, our favourite was the TBD Signature Salted Caramel Mocha Cappuccino which was absolutely spot on. Just for INR 120 and perfect for a rainy evening, this came with a kick of cocoa and salted caramel. From the variety of hot and cold drinks, breakfast items, sweet treats and savory dishes, we got the Chocolate Chip Waffle which was freshly made and the right amount of sweet, the Chick-Fil-A Wannabe Sandwich with fries (while the sandwich was basic and more like a burger, the portion was a bit small, but the fries were perfectly seasoned and crisp). We also tried the Peanut Butter Chocolate Cupcake which had a chocolate ganache filling and a peanut butter frosting — we have mixed feelings as the ganache was good but the frosting was a bit salty and grainy. For all that we ordered, the bill came up to just INR 564, which is great, especially since everything is made fresh in house, daily. You’re likely to see our names on the Wall Of Fame soon, as if you go 10 times and run up a bill of INR 300 each time, you get a customised mug that goes up. They take party orders for cookies, cupcakes and wedding cakes, so try it out for the next baby shower you throw.